I am glad I got off the couch. Exhausted, I arrived home from work at 7:00 p.m., turned on the Yankee game and immediately fell asleep. I did at least catch Brett Gardner’s first pitch dinger. Fast forward forty minutes and I woke up on said couch. So began the stay here you’re so warm and cozy versus the no, go out and make a photograph battle. The latter won out—and thank goodness. With a quick scramble for suitable clothes, I grabbed my gear and stashed them in the trunk. I made my way east to Cedar Run Dock Road listening The Order of the Phoenix. I cannot get enough of all things Hogwarts these days—albeit more than a decade late. Over the next four miles I was oscillating between sunset anticipation and sheer disdain for Dolores Umbridge. Checking the clock obsessively in between to calculate how much time I’d have to set up. I was cutting it close to sunset. With a few minutes to spare I was on the marsh and making the most of a quality early simmer pastel sky. 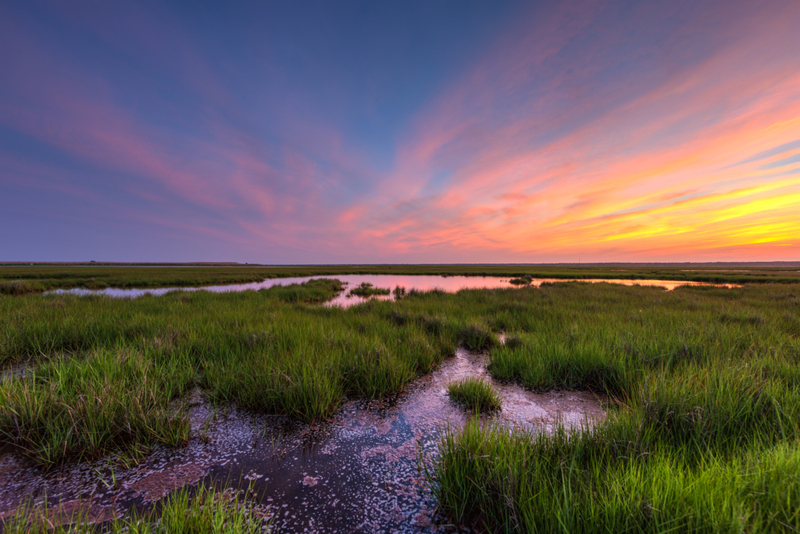 Cotton candy coloring overtop a rich green carpet of fresh marsh growth. I am glad I got off the couch.